He doesn’t know who I am anymore. It’s ok I still like chatting with him. Actually He isn’t always into chatting anymore either. But on a good day he will say a few things. I like the good days. Probably the saddest thing is that he doesn’t know his six sons anymore. My father-in-law is 91 and has had progressing dementia for the last five years -maybe more. Along with that he has Parkinson’s syndrome and his mobility is becoming difficult. In the beginning we didn’t really notice it. The repeated stories were normal and the little bouts of forgetfulness not too concerning – we could explain them away. It became more and more apparent to my mother-in-law. She knew the signs bc years ago she spent time caring for her own mother-in-law who had it. After a scan and a visit to his doctor he went on some medication that may have slowed the progression. Some. Two years ago he knew me. He had forgotten some other faces he hadn’t seen in a while but he knew my face even if he might have forgotten my name. He is good at hiding it. His need to be a good host -still- would never allow him to ask you who you are. And he was so good at faking it that for a long while I didn’t realize how much of his memory had slipped away. I have found that there will be slow progression then a big jump of memory loss then maybe it seems a bit better then worse again. But the slipping away is palatable and you want to grab onto an imaginary string attached to them and hold them where they are or better yet pull them back. I’m a lucky woman. My in-laws have treated me like their own child. I was welcomed into the fold of a big family right from the start. Dad is a quieter man. He liked kind and thoughtful conversation. One thing I will always remember was the day my husband,Kevin, brought my son Luke home from adopting him in Kazakhstan. Kevin travelled alone and had been gone three weeks. My in-laws arrived at the airport just before I did and had already found Kevin and my son I had never met and led them out to the pickup area at the airport. My mother- in-law was holding Luke on the sidewalk but it was my husband I was looking for. When I jumped out of my car I ran not to Luke first but to my incredible husband who brought me my first child. I hugged Kevin (I think I jumped in his arms!) and then I turned to my tiny little son and scooped him up into my arms. Dad leaned over and said to me. “You got that order right”. He was glad that I ran to my husband first. He saw my love right there I suppose and I think he was happy. He need not worry -all these years later I’m glad to say I’d do the same thing again. They raised an incredible man. Even though Dad has lost so many of his memories we still try to create our own memories with him. We try to keep our sense of humor too. I have to admit sometimes the things he says and does are funny. Once in a while he lets out a laugh at something we might be laughing about and I wonder if he is tracking the conversation. He will surprise you sometimes with what he is actually hearing and absorbing. We try to engage him in conversations as much as possible. I hate to see him staring out into the room as others chat away- but sometimes – more often now- that is the kind of day it is. But the other day was a good day we chatted quite a bit and he told me how he developed surveillance film in World War II. His words aren’t fluid and sometimes when a memory fades so does his voice. But I kept trying to gently bring out the memory. I think it was selfish of me in a way bc I wanted him to seem like the old him when he could remember such things easily. He also told me that he lived in New York. I didn’t know this and I checked the fact with my mother-in-law who confirmed it and she seemed happy that he recalled it. I asked him if he remembered his time in Brockton, Mass where he grew up. He seemed to remember some and said it was not far from Boston. I was happy that he could bring those memories forward and talk about them- even if they are somewhat vague to him. Dad was a pin setter at the bowling alley in his town when he was a teen. He joined the army at 17 and went off to WW2. He served in the Philippines for part of his stint but I don’t know much more. He came home and worked at the FBI where he met his wife of almost 68 years(yes 68 years). They spent 3-4 years in England where my husband – their youngest- was born. He has 6 sons – 11 grands (I may have miscounted ) and 8 greats(?). He retired from NSA when my husband -the baby- was in high school. He spent the years since with his bride – and a more loving couple you won’t ever meet. As I wrote the lines in the paragraph above I thought about all the memories created in between these events and then realized he’s forgotten so many of them. I hate dementia. Dementia is a thief. It robs the person or their memory and the family of the person they once knew. I hope and pray that there is a cure someday. Better yet a prevention. 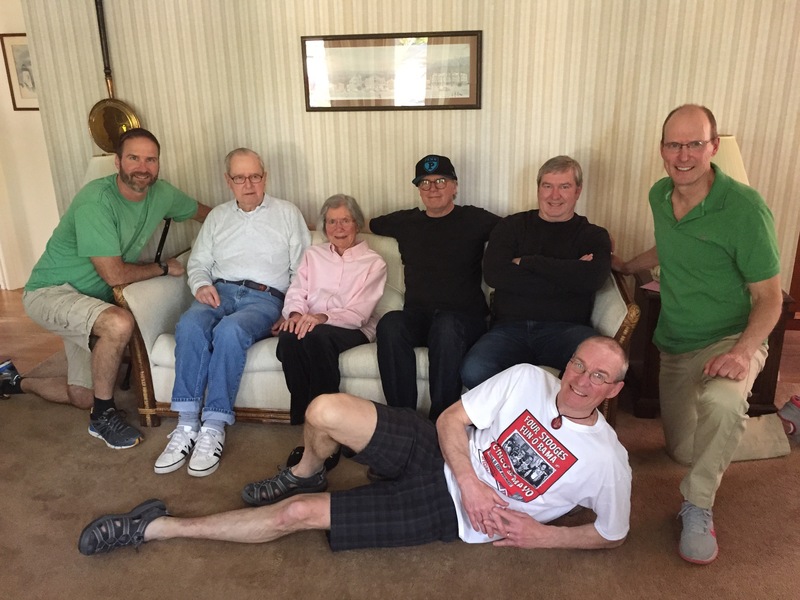 Dad and my mother-in-law are well cared for in their home of 50 years by three sons who have time now as their families have grown. How lucky that they can help their parents who have loved all of them so very much. It is the true circle of life and I am happy to be part of such a wonderful family. Each time we leave after a visit and I go to say goodbye I feel like I am saying goodbye to one more piece of him forever – one more part that will slip silently away…this is the longest goodbye I have ever had…. 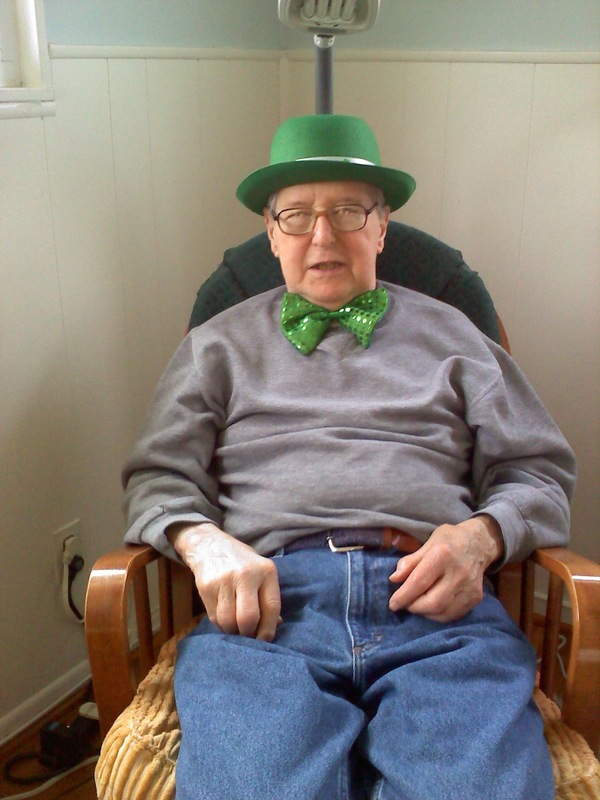 Mr. Sweeney on Saint Patty’s Day. If he remembered he would tell you he has more swedish than Irish in him.